5 Things To See in St. Petersburg June 8, 2015 · 22 min. readThis article may contain affiliate links. If you're a fan of the sun, beach, palm trees, or the National Hockey League, you'll probably be eyeing up Tampa, Florida in the next few weeks (assuming the Tampa Bay Lighting will win the series). But, just south of the metropolis is another, much smaller, but very beautiful city of St. Petersburg. Named after the city in Russia, St. Petersburg is a bustling community of history, culture and art. 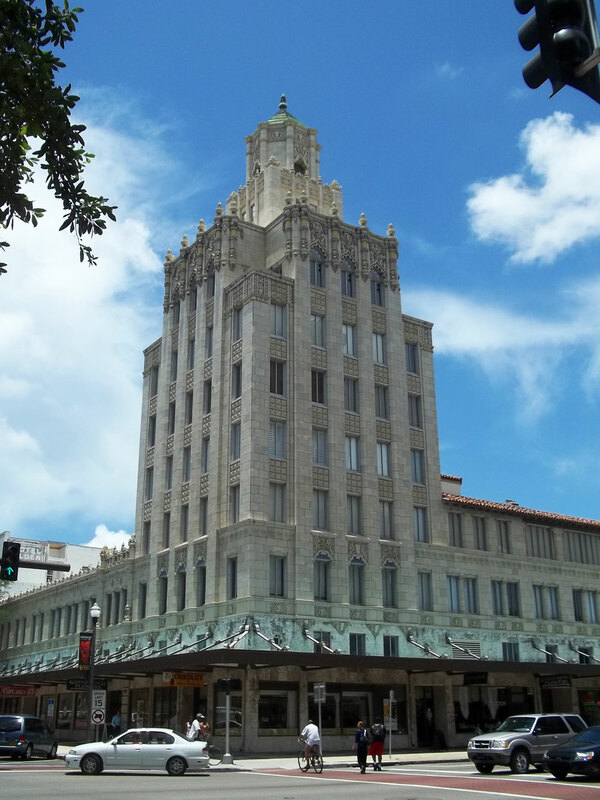 Having its name chosen by a coin flip, "St. Pete" was founded in 1892 with a population of only 300 people. Situated on the Tampa Bay peninsula, fishing was a very important part of the city's history, and the deepening of the shipping channel from 1906 to 1908, and again during the 1910s, allowed for larger boats to gain access the city's port. Twenty years after being founded, the population had boomed to over 4,000 people. In 1914, St. Pete made history when Tony Jannus flew the first ever commercial airplane out of the city and across Tampa Bay. 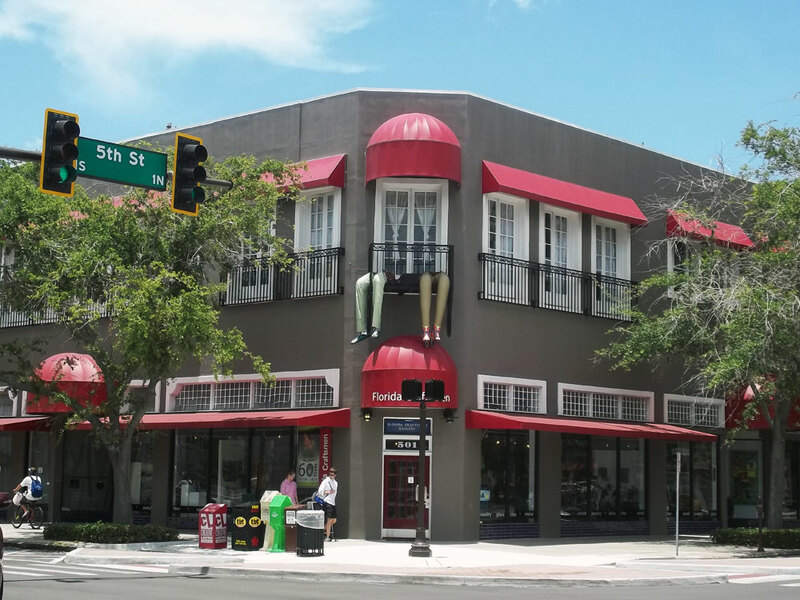 In the 1980s St. Pete once again made international attention as it was chosen to house the greatest collection of works by Salvador Dali outside of Europe. I had the pleasure of spending three days in St. Petersburg while I attended the Front-End Design Conference back in 2013. 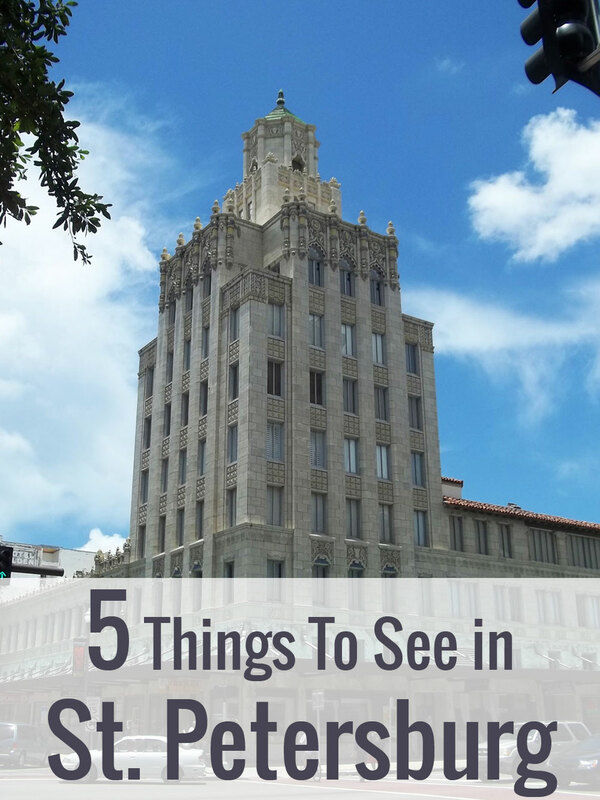 Although I didn't have too much free time to explore the city, I saw a few points of interest. I know I missed a lot of incredible locations around the city, so I hope this encourages you to visit it and make your own memories. 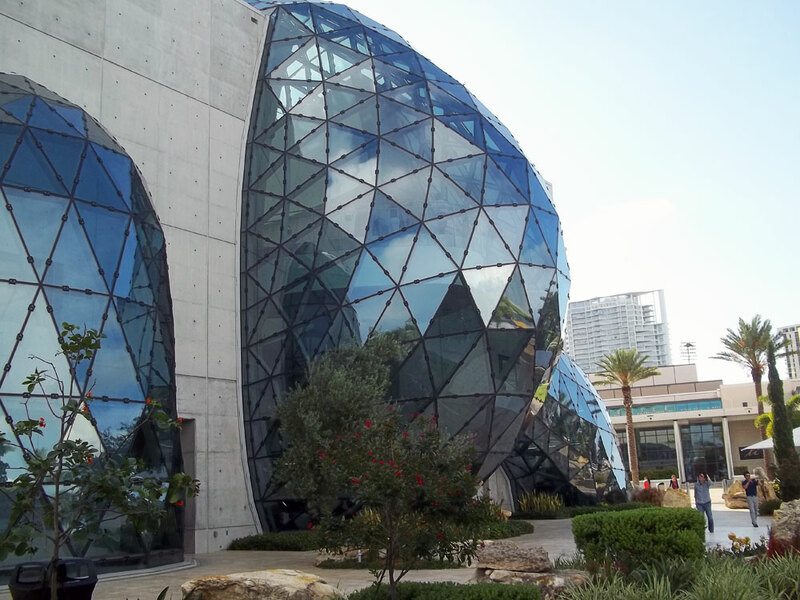 When I began asking what to see in St. Petersburg, I was told to check out The Dali Museum. Being somebody who knows nothing about art, the idea of going to an art gallery didn't really appeal to me, I had no intentions of going. But, not sure what to do around the city and having a hotel only a few blocks away, I decided to check it out. Salvador Dali was a Spanish artist, painter, sculptor, filmmaker, jewelry designer, and writer during the early to late 1900s. While known for his obscure antics to most, his work is regarded as some of the greatest of the 20th Century. Evolving from realistic to surrealistic art, his work varies from a simple loaf of bread on a silk tablecloth, to that of a horse being fired out of cannon, melting airplanes, winged children, himself and his cello melting and daddy long legs crawling over his face, all in one painting! (It's called "Daddy Longlegs of the Evening – Hope!" for anybody interested). His life had been punctuated with drama from a young age. Nine months before he was born on May 11th, 1904, Dali's elder brother, also named Salvador, died. Dali was named after his bother and at the age of five his father took Dali to his brother's grave and told him that he was the incarnation of his older brother. Dali would later say that his brother "was probably a first version of myself but conceived too much in the absolute". At the age of 18, Dali began studying at the School of Fine Arts in Madrid. He was known for his eccentric behavior, but more known for his incredible artwork. In 1926 he was expelled just before his final exam, claiming nobody at the school was qualified enough to examine him. In 1929 Dali joined a surrealist group in Paris, where he met his wife Gala, who he would later feature in many of his paintings. Gala proved to be Dali's polar opposite, so they fell in love. While Dali was a fantastic artist, he was not a good businessman. Gala was great with money, so she focused on managing and controlling his finances. In 1931 he created one of his most famous paintings, "The Persistence of Memory", which is widely known for its iconic melting clocks. By now, Dali was sporting his famous mustache and he had begun to dabble into cubism and psychology. Greatly interested in Sigmund Freud and his ideology, Dali used many Freudian elements in his work. However, there was one part that he never accepted, and that was Freud's belief that once we strip away our ego and superego, we are left with only our primal, violent "id", which transforms any person into a madman. Dali said in response to this: "There is only one difference between a madman and me. I am not mad. ", showing that man is not separate from his barbaric self, only that we life in harmony with it. Salvador Dali accomplished a lot of things in his life, and worked along some very influential artists such as Alfred Hitchcock, Walt Disney, Pablo Picasso, Joan Miro and photographer Man Ray. Besides paintings, he created films, wrote stories, and drew logos, all the while capturing international attention with his wild behavior. In 1934, at the age of 30, Salvador Dali was expelled from the surrealist group in Paris. They were outraged by his refusal to take a political stand against fascism and commercialization of his work. Dali responded to this by saying: "The only difference between me and the surrealists is that I am a surrealist." In 1936, at the opening of the London Surrealist exhibition, he delivered a lecture while dressed in a wetsuit, carrying a billiard cue and walking a pair of Russian wolfhounds. He said his attire was a depiction of "plunging into the depths" of the human mind. After World War II, Dali's artwork changed. With the bombing of Hiroshima and Nagasaki, and the subsequent Cold War, his focused on "Nuclear Mysticism". This took his surrealistic artwork into a new direction, and he began to apply science and religion to it, including elements of divine geometry such as the golden ratio, and the incredible complexity of DNA. He used this to recreate his famous painting "The Persistence of Memory", and transform it into "The Disintegration of Persistence of Memory", which showed the clocks, the shore, the trees and ocean all being broken down into bits. It was also this time when he painted "The Sacrament of the Last Supper", and his masterwork "The Discovery of America by Christopher Columbus". A. Reynolds Morse & Eleanor R. Morse, two avid collectors of Dali's work purchased "The Discovery of America by Christopher Columbus" and noticed a flaw in the painting. In the bottom corner was a sea urchin with a golden halo around it. Feeling this was an imperfection in the painting, they requested Dali to paint over it. Dali refused the request, saying Morse needed to "contemplate it to understand". Morse didn't think of it until a decade later on July 20, 1969 when he witnessed the Apollo 11 Moon landing. He realized the sea urchin was actually a symbol that America would go on to explore other planets, much like the tradition of their own country being explored. Morse called Dali to tell him that he finally understood what the sea urchin meant, in which Dali replied "Yes, of course. It took you this long to figure it out? Incredible! Now I must get back to work", and hung up. The Morse's collection of work continued to expand, and would find its way to St. Petersburg. 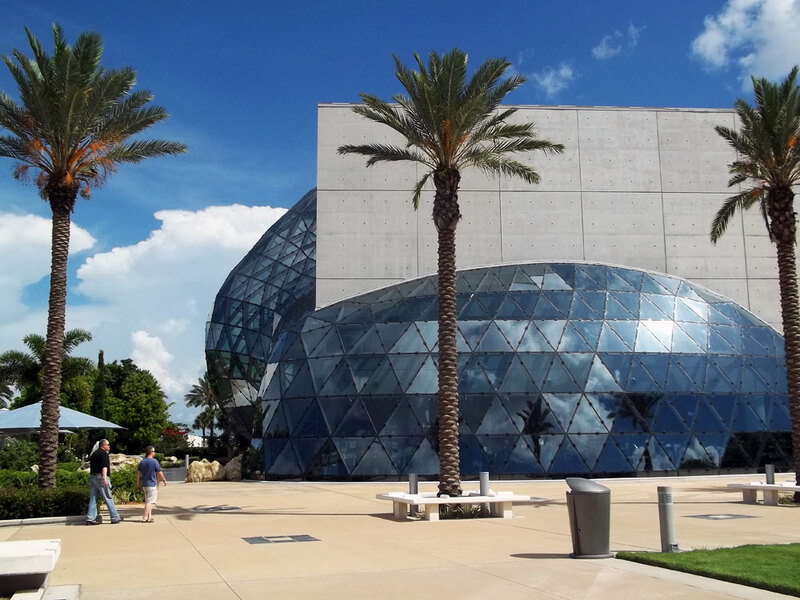 In 1982 the Salvador Dali Museum opened, and in 2008 the new museum opened, allowing more people to visit and experience the incredible mind of Salvador Dali. Walter Lobenberg was a German Jew during the 1930s, and faced extreme prosecution. After the events of Kristallnacht, the Lobenberg family contacted their aunt in the United States and immigrated there for safety. Walter would then enlist in the United States Military and return to Europe to fight against Nazi Germany. In 1948, he would meet his future wife Edith, another German Jew that fled to America. In 1992, they started the Holocaust Center with the idea of "teaching the members of all races and cultures the inherent worth and dignity of human life in order to prevent future genocides". Their first exhibit, "Anne Frank in the World", was found to be so incredibly popular that by 1996 they needed to find a larger building. In 1998 they did, and in 1999 they changed their name to the Florida Holocaust Museum. The museum starts discussing Jewish life in Europe prior to World War II. This is the childhood of Walter and Edith Lobenberg. At the time, Europe was beginning to accept Jewish religion and culture, and the younger generations of Jews were were beginning to welcome European culture. Clothing, food, music and film all transformed for both parties. Western European Jews were much sparser, so their accepted Europe culture more easily. Eastern Europe Jews weren't as conservative, and change was much slower. However, across Europe Jewish culture was mingling with European culture in general peace. Although about 60% of all Jews lived in Europe, they only made up a small, 1.7% of the population. This changed during the 1930s with the rise of Adolf Hitler and Nazi Germany. Hitler believed the Jews were responsible for Germany's defeat in World War I, and their subsequent suffering. Hitler had a personal vendetta against them as well, as the doctor that was unable to save his mother's life was Jewish, and the professor that denied him entry into art school was Jewish. After resurrecting the Post World War I Germany from the ashes, and having his country quickly becoming a world leader in science, music, sports and technology, Hitler used his power against the Jews and stripped away their rights, turning the country against them, crushing an already small population into almost oblivion. This climaxed at Kristallnacht, and is what caused the Lobenbergs to flee. The museum then focused on the world's response to the rise of Nazi Germany. Europe didn't want a second war, as it was still recovering from World War I. North America also didn't want a war, as it was trying to settle after the Great Depression. These countries allowed Germany to take Sudetenland, and Austria happily joined Germany, welcoming the new government. Germany then absorbed Czechoslovakia, and the world watched silently. It wasn't until Germany forcefully invaded Poland did war officially break loose. Jews, homosexuals, gypsies and Africans were Hitler's main target of extermination, and many fled to escape the ever growing black claw of Nazism. On May 13th, 1939, the transatlantic liner St. Louis sailed from Hamburg, Germany, for Havana, Cuba, carrying nearly 1,000 Jews. Even before setting sail, conditions in Cuba seemed unfavorable. Much like the the rest of North America, Cuba was trying to recover from the Great Depression, and the already 2,500 immigrated Jews were seen as competition to the workforce so another thousand were simply unacceptable. Once arriving, only 28 passengers were allowed off the St. Louis. One additional passenger was let off because he attempted to commit suicide and needed medical attention. Of the remaining 908 passengers, 743 of them were awaiting US Visas. These Visas never came. Unable to stay in Cuba, the liner drifted past Florida, close enough to see the lights of Miami. Within a few days, Washington made a decision: the Jews would not be allowed to land in America, and must return to Europe. Once arriving back in Europe, the refugees were accepted by various countries. Great Britain accepted 288 passengers, the Netherlands accepted 181, Belgium accepted 214 and France accepted 224. Within 2 years, all the countries besides Great Britain fell under Nazi Germany. The museum then focuses on the Holocaust, and the systematic murder of over 6 million Jews. Often, people hear of the Jews simply being pushed around by the Germans, being forced to work until they died, or later simply being executed. I learned something new about the Holocaust at this museum: that the Jews weren't silent victims, and that Jewish uprising occurred in many of the camps in the woodlands of Europe. In fact, uprisings spanned all of Europe, from Vichy France to Poland, and were a testament to the courage and strength the Jewish people still had. These heroics are often overshadowed by the Allied forces, but are still equally as important. 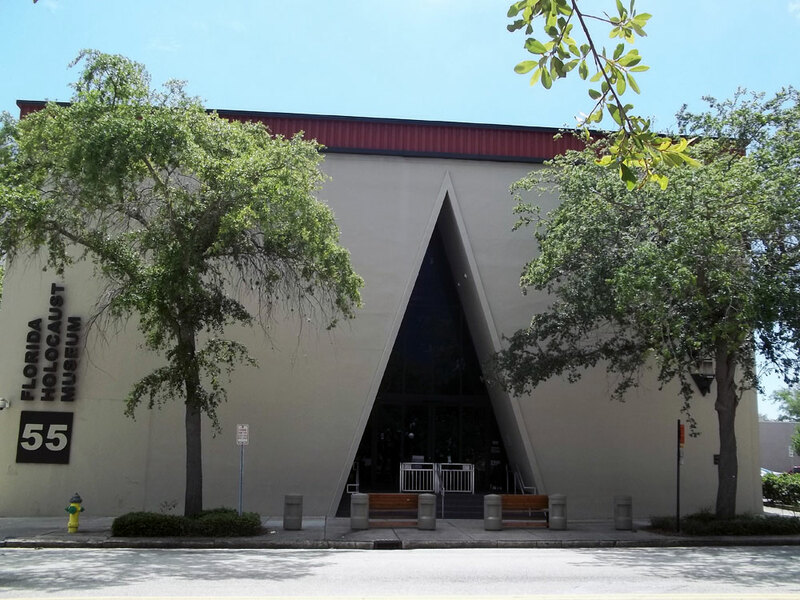 The Florida Holocaust Museum comes to a conclusion after this, ending in the center of the museum. It ends in the "History, Heritage and Hope" exhibit that focuses on how Jews are treated after World War II and the continuing anti-Semitism against them today. Although 70 years have passed since World War II, Jews still have no home. Israel, created specifically for them, is often at war with itself, Europe continues to resent them, and the United States, while sympathetic towards them, also has pockets of violence against them. This section of the museum focuses around the struggle Jews still have today, which are very similar to a very different world of the 1930s. In the center of this exhibit is Boxcar #113 069-5, a boxcar used to transport Jews and other prisoners to places like Auschwitz and Treblinka. This is one of the few remaining boxcars from that time period, and sits on the original track from the Treblinka Killing Center. A few years ago, the boxcar was being cleaned and an engagement ring was found jammed between the floorboards. Nobody knows who the ring belonged to, or if they survived the Holocaust. Today it is also on display at the museum. 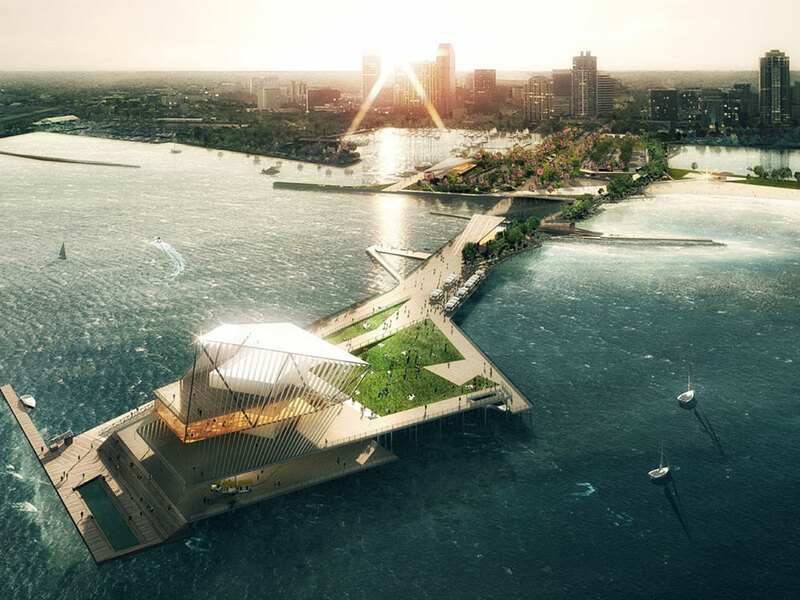 St. Pete's most iconic building is The Pier, which is an inverted pyramid at the end of a 300 foot long dock, extending into Tampa Bay. The Pier offers a variety of actives, such as shopping, dining, nightlife festivities, fishing, boat rentals, weekly festivals, and the Pier Aquarium. The Pier was even often featured in seaQuest DSV, a television series during the 1990s. It was also the location where a "monster fish" killed Dorothy MacLatchie on June 17th, 1922. On March 20, 1976, the city created a laser sculpture entitled Starboard Home on the Range, Part VI, which was to beam from downtown St. Pete, reflect around The Pier several times with mirrors and then shine out into the bay. However, the city had trouble controlling the temperature of the laser and it kept overheating, eventually shutting down the project. This current pier is the sixth version, with other versions being built in 1889, 1906, 1914, 1926, 1967 and 1973. It was decided in 2010 to demolish the current pier and built a seventh one. May 31th, 2013 was the last official day for the public to visit the pier, two weeks before I visited the city. 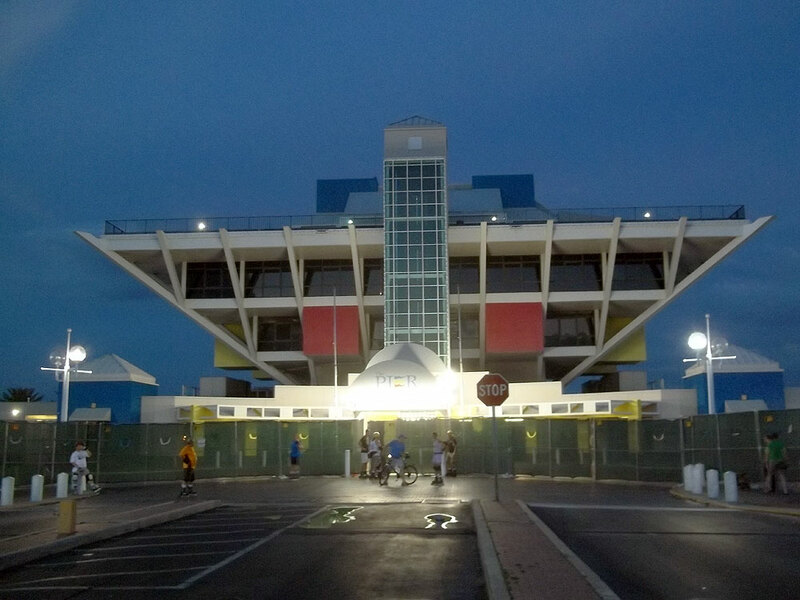 I was disappointed I was unable to visit this iconic structure, but upon seeing what the city has planned next, I am more than willing to return to St. Pete's just to experience The New Pier. 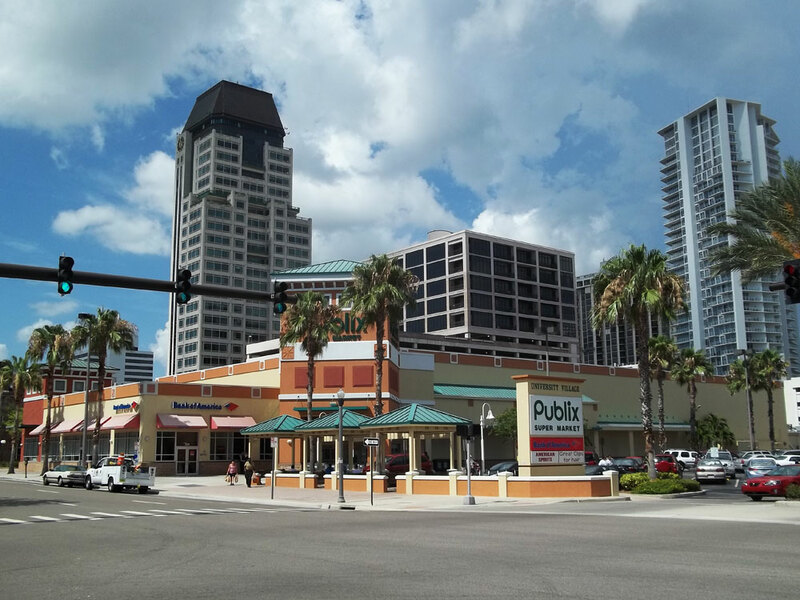 Known as the "Sunshine City", St. Pete is dotted with dozens of outdoors malls and restaurants. Patios, plazas, parks and markets are full of tables of people eating and enjoying the weather, while local bands either play among the tables or above on a balcony. To a Canadian, who's weather varies from extreme cold to extreme heat, eating outdoors is risky and any outdoor restaurant is lucky to get a good 50 days' worth of the year. I took advantage of these markets, and enjoyed their many unique restaurants and stores. I implore you to do the same! Like I've said in countless articles, if you're going to enjoy a city, go get lost in it. 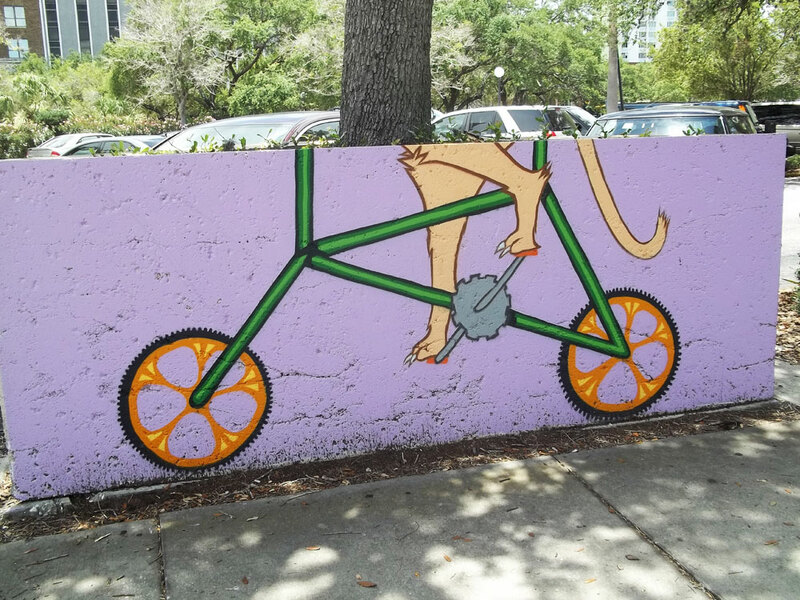 St. Pete is no different. With an impeccable transit system, you can witness the beautiful architecture from inside a comfortable, double-deckered bus. Fees to ride the bus cost only $1, which is incredibly cheap! If you choose to walk the streets, you can see the quirky shops, malls, parks and museums that cover the city. 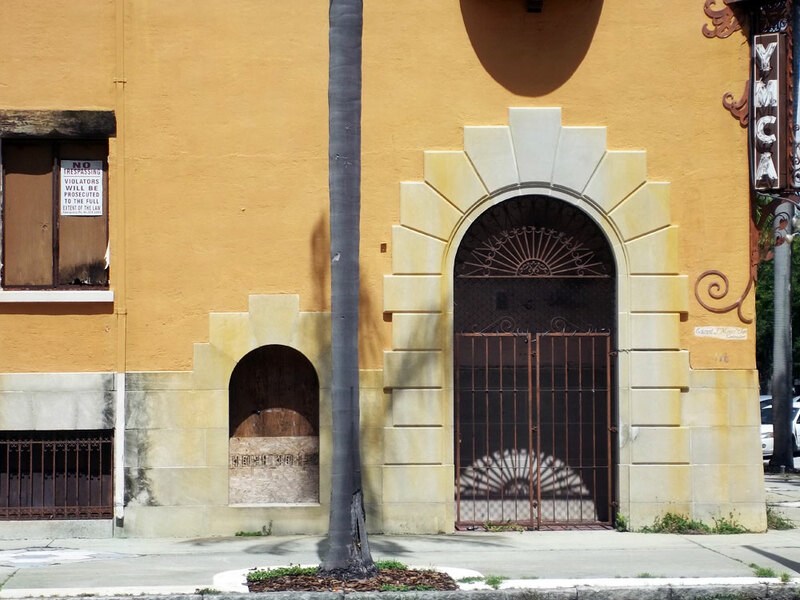 Florida is a very heavily Spanish state, so many of the buildings show Spanish characteristics, with yellow paint, white trim and Western European arches. 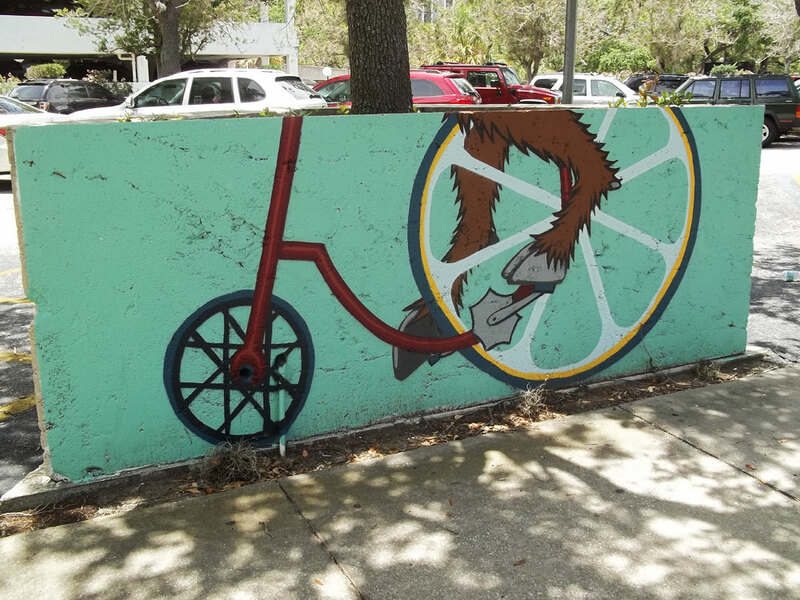 Art also flows from St. Pete, with statues, clocks and murals found throughout the city. It seems no matter where I went in the city, I had to take a picture of something quirky, funny or downright bizarre, like legs hanging out of windows or paintings of animals riding bicycles. I wish I could have had more time in this brilliant city, and explored things like the Sunken Gardens, the Museum of Fine Arts, or the Florida International Museum. I hope one day to return and learn more about it, and fully experience what America's Sunshine City has to offer. 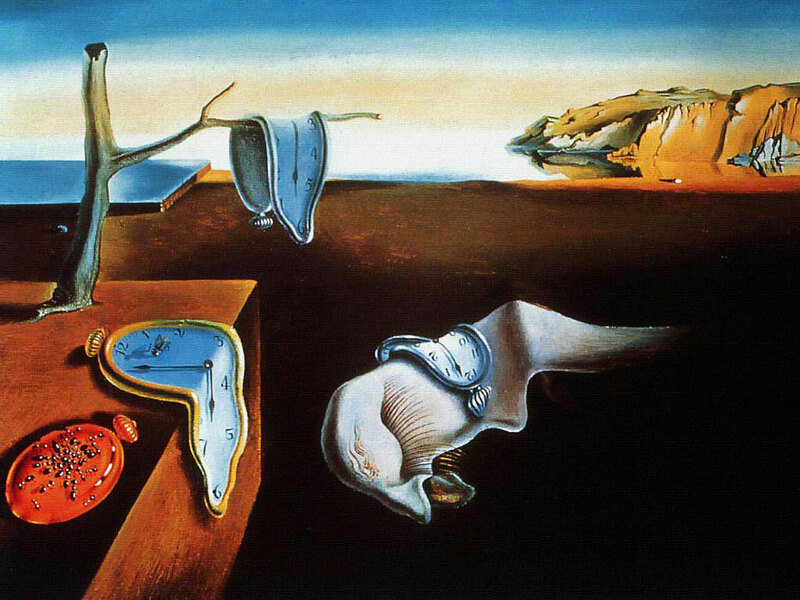 The image of Salvador Dali's painting "The Persistence of Memory" is used from A Reasoner's Miscellany.